It’s a fact that not everyone is a dog lover. While we may not know any right off hand, every now and then we meet new people and sometimes invite them over for a cup of coffee or a chat to get to know them better. First of all, make sure that your guests know you are a dog owner. The last thing you want is an unexpected surprise situation. Knowing their preferences will allow you to alter your plans or make adjustments prior to their visit. It’s respectful and won’t hurt anyone’s feelings. What if they’re already at your door though? Perhaps a repair man shows up or even a traveling salesman knocks on your door. Luckily, most repair companies have become accustomed to asking if you have pets in your house prior to the visit, so be sure that you disclose this information to them (no need for details such as size or breed). But what happens if your guests show up and don’t take to your dog as expected. They may be intimidated by their size or even the breed. Though you may be sure your dog is the sweetest pup out there, there are many breeds which can seem a little intimidating, such as the Mastiff or Rottweiler, at first appearance. The best technique is to not let your dog greet guests at the door. This can often intimidate both parties, and that’s not a good situation for your pup to experience. 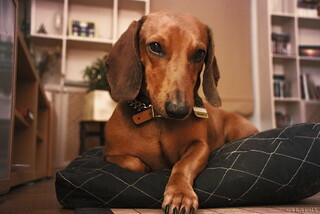 Instead, keep your dog back and introduce them after your guests have entered the home. Watch their body language and stay with them upon introductions, just in case your dog doesn’t like their presence. In most cases, dogs will want to investigate initially, but will quickly return to their regularly scheduled program. Of course, some conditions can be a little annoying, even for you. If your dog is overly excited, practice the introductions slowly. If you let them greet visitors at the door, they can show initial signs of aggression (they can sense when others are uncomfortable) or just downright want to hop into their arms and be their best friend. In these instances, some owners prefer to keep their dogs behind a pet-gate where they can still see the activity but won’t be able to approach the guests. While it might seem restrictive for your pup, it often helps reduce anxiety and allows your guests to relax without a pup dancing all around them. What if your guests are allergic? Just because your visitor seems uncomfortable with your dog, doesn’t mean they don’t like them. Many people, even dog owners, are allergic to dogs. In this case, it’s best to try to make your guest as comfortable as possible. And keep in mind that just because your dog isn’t present, doesn’t mean allergies won’t kick in, so confining your dog isn’t the best solution. Instead, give your dog a bath. Allergies aren’t from dog fur as commonly believed. They’re actually from your dog’s dandruff (flaky skin) and even urine (which you hopefully keep outside or in their litter box). And 99% of dust is skin, which means that cleaning your dog and your house will greatly reduce allergy tendencies (a helpful hint for allergenic dog owners out there). Cleaning house before visitors would consist of vacuuming the carpet and couches to pick up any dust or pet dander that is just lying around. Additionally, it’s best to keep lint-brushes handy for your guest’s use to ensure that they aren’t taking any allergies home with them. In most cases, if you can make your guests feel comfortable in your home, you’ll find that they may actually enjoy being around your dog, too. Always remember that not everyone enjoys being around dogs or even other pets. But it’s your responsibility, to both your dog and your guests, to make sure that everyone knows the rules of your home before you make any plans. But as long as you can make everyone feel comfortable, you’d be surprised at how many people like dogs more than they thought they did.